Which vape battery should you choose? Choosing batteries for your mod device can be one of the most confusing aspects of vaping. There are so many identification numbers and letters to know, that you almost need a chemistry degree to decode them all. Well, VapeVine.ca understands your frustration and wants to make it easier for you. So, let’s quickly look into this mess and discover what most of these numbers and letters really mean. But before we do, remember, always take battery safety very seriously. Certain precautions must be taken to prevent accidents resulting from wrong polarity connections; overcharging & over-discharging; impact, vibration or pack rupture; water, salt, chemical, fire or heat exposure; below-freezing charging, and other hazards. For example, did you even know that Lithium-ion batteries cannot be charged below 0°C (32° F)? Doing so is dangerous and will compromise their safety. Thus, never leave batteries or your vaping devices in your car, especially during a cold Canadian Winter. Consult this PDF for more information on Lithium Ion battery safety. You’ve probably all seen the famous IMR 18650 moniker either mentioned, written about or recommended by various vape shops and blogs. It seems to be the most popular type of battery used for vaping applications. But, what exactly does this ID code mean? And, more importantly, do all IMR 18650 batteries in Canada have exactly the same features and characteristics, and can you just interchange them? Indeed, the batteries most often used in modern vaporizers tend to follow this 3 letter, 5 number nomenclature. So, batteries listed as IMR18650, IMR18350, ICR14500 and so on, are actually telling you a short story about themselves. The first three letters indicate the battery’s construction: it’s chemical composition and metal oxide element. The five numbers specify the size of a battery (more on this later). NOTE: Since IMR and ICR are the two main types of batteries historically used in ecig mods, these will be the focus of this article. This indicates “Lithium Ion”. This is a family of rechargeable batteries in which lithium ions move from the (-) negative electrode to the (+) positive electrode during discharge and back when charging. The (-) negative electrode is usually made of graphite. The (+) positive electrode is often made of a Nickel, Manganese or Cobalt material. This indicates the “Material” of the positive electrode. “C” means Cobalt; “M” means Manganese; “N” means Nickel. Simple enough. So, when you see “ICR” it is saying that it is a Lithium-Ion / Cobalt battery; while “IMR” is saying it is a Li-Ion/Manganese battery. It is generally accepted that manganese or nickel make for a “safer chemistry“. Why are IMR batteries considered a “safer chemistry”? There are a number of reasons why IMR or Lithium-Ion/Manganese batteries are considered a safer choice. Compared to Cobalt, Manganese batteries (IMR) have a lower internal resistance and a higher heat tolerance. They are capable of delivering a higher current while avoiding excessive thermal build-up and still maintaining charge capacity. IMR are considered high-drain, longer-life batteries. Cobalt oxide batteries (ICR) are considered more dangerous, especially when damaged or exposed to high temperatures. Cobalt is susceptible to a process called “thermal runaway”, in which the cobalt oxide can begin to self-heat and create an internal pressure that can lead to an explosion. SAFETY NOTE: VapeVine.ca does not sell ICR Batteries! The 5 numbers (e.g. 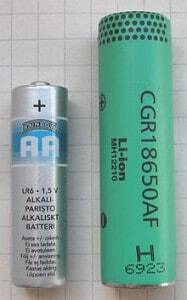 18650, 18350, 26650) found on a typical IMR battery are a commonly-used designation to indicate the physical dimensions of the cylindrical cell. The first two digits (e.g. “18”) are the approximate diameter in millimeters. The last three digits indicate the height of the battery in tenths of millimeters. 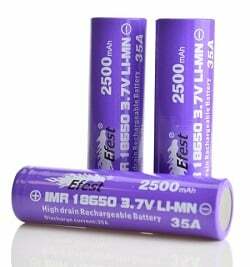 So, when you see an 18650 battery, you now know that it is 18mm in diameter and around 65 mm in length. Following that logic, an 18350 battery is 18mm in diameter and 35 mm long, whereas a 26650 battery is 26 mm in diameter and 65 mm long. Get it? Got it? Good. Battery capacity is simply defined as how long your battery should last per charge. The “mAh” or milliamps-hour rating gives you an approximation of your battery’s life. All things being equal, the larger the mAh rating, the longer your battery should stay charged. There are too many variables to give an exact measurement of how many real-life hours that equates to. When it comes to vaping, the actual charge available from the battery depends on numerous factors like operating temperature, coil resistance, the voltage / wattage demands of your device, the rate at which you discharge (number of puffs), and so on. Some users like to estimate how long their charge will last using a “ballpark equation” of 100 mAh = 1 hour of use. By this equation, 2500 mAh should last about 25 hours. 3100 mAh should last 31 hours, etc. Unfortunately, real-world usage often reveals the inaccuracy of such expectations. Glossary: Regulated means your device has a built-in chip that automatically controls the voltage applied to the atomizer (coil) for a continuous output of, say, 3.7 volts throughout the entire charge. If battery drops below a certain level (3.3 volts typically), your device will cease working until you recharge the battery. Most cigalike, ego-twist, tube-style mods, and box-style mods sold are now regulated. What does “Maximum Continuous Discharge Rate” Mean? Also called the Constant Current Discharge or CCD rate, this is the max discharge current or amps that the battery will safely discharge at. It is how many Amps you can draw from the battery without getting into danger. Basically, if you were to hold down your vape button for one long continuous draw, the Max Continuous Discharge Rate is the highest number of amps that you could safely pull from the battery if it were to go from fully charged to empty. Vapers, of course, do not hold down their draw button continuously, but rather take drags intermittently throughout the day. Which is a good thing, because you really don’t want to push your battery to its Max Amp Limit. Indeed, it is always a good idea to have a safety cushion when it comes to your Max Continuous Discharge Rate. Remember, your atomizer coil will draw a specific amount of current (amps) from your battery. But that current must not be more than the total amps in continuous discharge rate of the battery, otherwise it will create an unstable condition for your battery. This is why most modern mod batteries have vent holes integrated in their design, to relieve possible pressure and dissipate any heat build-up in the tube or box from improper or excessive use. If you are using sub-ohm coils, it is a good idea to get familiar with this handy Ohm’s Law calculator to help you determine how many amps you’ll need to handle the resistance of certain atomizer heads. Rechargeable Lithium Ion batteries are potentially hazardous and can present a serious FIRE HAZARD if damaged, defective or improperly used. THE BATTERY HAS BEEN FULLY DISCHARGED AND IS NOT RECHARGED SHORTLY AFTERWARD. This potential is aggravated if batteries are damaged, contain an undetected factory defect, are used or stored at temperature extremes, or are approaching the end of their useful life. (See useful life) Ideally, batteries should be recharged within 24 hours of a full discharge. CHARGING IS ATTEMPTED AT TEMPERATURES BELOW 40°F (4°C). Charging below 40°F (4°C), causes a chemical reaction in the battery cells that can cause permanent damage and the possibility of fire or explosion during charging. THE BATTERY HAS BEEN EXPOSED TO LIQUIDS, ESPECIALLY SALTWATER. Exposure to liquids can cause internal corrosion or damage to the cells or to the Battery Management System (BMS). The BMS protects the battery from overcharging, high self- discharge or imbalanced charging of the cells, any of which can present the possibility of fire during recharging. OPERATING OR CHARGING A BATTERY THAT HAS BEEN DAMAGED FROM DROPPING OR FROM SHIPPING DAMAGE. USING A CHARGER OTHER THAN SPECIFICALLY DESIGNATED FOR THE PARTICULAR BATTERY. The following recommendations, in addition to those precautions above, should be followed when charging Lithium Ion batteries to ensure the avoidance of potentially catastrophic fire or explosion. Charging should be performed in a fire-safe area, away from children or pets. For maximum safety, a metal trashcan with lid placed on a non-flammable surface is suggested. Never charge batteries unattended, or where objects such as carpet, furniture, wood or vinyl floors, curtains or other flammable objects are present. Charging should be performed at a temperature between 40°F and 110°F (4°C and 43°C). Never charge below 40°F (4°C). Do not attempt to charge a battery that is swollen or bulging. Use only supplied charging cables and connections. Make sure connections are in good condition. Do not allow the charging polarity to be reversed or short-circuited. If equipment is connected during charging, equipment should be switched off. As a delayed chemical reaction can occur if a fault is present, observe the battery in a safe place for at least 15 minutes after charging is complete. A healthy battery should only get slightly warm during charging. If the battery becomes hot, smokes, swells, or gives off an odor during charging, terminate charging immediately and contact the manufacturer. Note – the charger itself may get quite warm to the touch when charging a deeply discharged battery. Batteries may be safely discharged at temperatures between 4°F and 140°F (-20°C and 60°C). Note this is the safe battery temperature rather than ambient temperature. Heavy use (frequent flashing) will cause the battery to develop internal heat beyond the ambient temperature. Batteries should be stored at temperatures between 40°F and 80°F (4°C and 27°C) for maximum life and safety. Higher storage temperatures increase the self-discharge rate from the nominal 1-2% per month to as high as 35% per month, and can reduce battery life and increase the possibility of catastrophic failure with long term high temperature storage. Never store batteries at temperatures higher than 170°F (76°C) as this can potentially result in self-combustion. Batteries may be stored at 100% charge if used frequently. However, for maximum life, batteries infrequently used should be stored at 40% to 70% charge.